Faced with mounting evidence about the importance of social factors—such as income, access to food and housing, and employment status—in determining health outcomes, state Medicaid officials are looking for ways to integrate services that address these factors into their coverage, payment, and delivery models. Medicaid can’t solve societal problems on its own, but federal regulations make it clear that it can be a partner in community efforts to address the social determinants of health—and this issue brief explains how. Prepared at the request of the Milbank Memorial Fund’s Reforming States Group, with support from the New York State Health Foundation, the issue brief is a practical guide for policymakers who want to know when and how states can use Medicaid to facilitate access to social services. It offers a road map of the legal authorities upon which policymakers can rely to extend Medicaid coverage to social interventions and provides examples of how Medicaid can be an important component in the critical work of improving the health of populations. 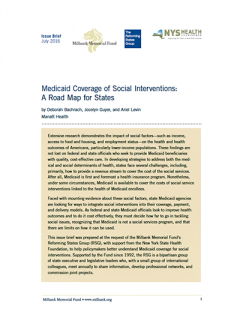 This issue brief is a companion piece to our May 2016 report, Investing in Social Services for States’ Health: Identifying and Overcoming the Barriers, which looks at how state officials can shift the public focus from medical care and act on the evidence of the importance of social determinants in improving population health.